Thanks to the indie gaming scene, most genres from the 80s and 90s have been given a second life in retro titles but there is one that has actually remained a bit left out. Yet, Out Run, Crazy Cars II, Lotus Turbo Challenge 2, Top Gear, Lamborghini American Challenge, Jaguar XJ220 and so many others have defined what the racing genre is today. 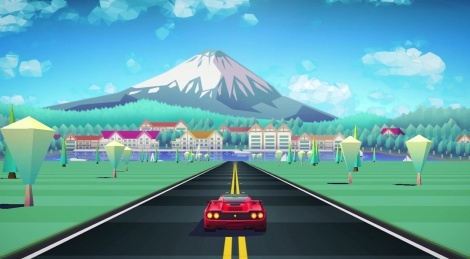 Brazilian studio Aquiris has decided to pay tribute to these titles with Horizon Chase, an arcade game which will first be released on iOS before being adapted on PC and consoles. If you're interested in the project, keep an eye on their tumblr. 8/16-bit-style game without 8/16-bit graphics. I like. looks good, and music is important in racing games, forget clueless new devs who want us to listen to boring engine sounds only, the only racing game on next gen with good in game music is The Crew, in the missions, thanks to Ubisoft for that. Clueless? I hate listening to music in a sim racer and I don't think Formula One or rally pilots turn the radio on when competing. It simply depends on the kind of driving game you wish to play. Old western devs on PS1 never released a racing game without music and also Japanese devs. But why would a new Chase HQ have to stick to it's classic look ? No, make it a fully fledged next gen title with awesome graphics. That would be even more awesome. I'd buy that the second it hit store shelves. Now if such a CHQ sequel included shooting too, with helis dropping bonus items like rpg's from above like in Chase HQ 2 on Amiga (so basically racing + gunplay) combined with destructible tracks, that would be... god like. Imagine a Split/Second that included shooting, playable in coop, something like this: http://dronami.com/blog/sciarc01.png F... yeah !